Come meet my new Rockabilly Rooster! Please welcome Everly the Rockabilly Rooster! Here he is with his PSI the Rooster Roadster! Check us out on the front page! Last edited by dancerchick914; 11-07-2012 at 12:53 AM..
Re: Welcome home Everly! 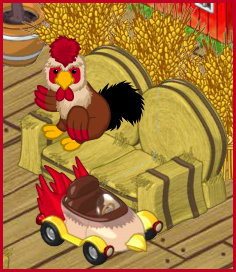 Come meet my new Rockabilly Rooster! Congratulations on your cute new November adoption! I love it! Such a cool name too! You are first to adopt this pet! I will flag for front page recognition! Re: Come meet my new Rockabilly Rooster! Congrats on your new pet! Welcome Everly! That's a really cool rooster! I love the PSI!! Congratulations!